This essential oil is used in aromatherapy as it has excellent antiseptic and stimulating qualities. It is extensively used to clear infections such as bronchitis, catarrh and sinus, as well as acne, boils, burns, ulcers and cuts. Niaouli oil has a slightly sweet, fresh smell and its color varies from colorless to pale yellow and greenish. This large evergreen tree is native to Australia, New Caledonia and the French Pacific Islands and has a flexible trunk, spongy bark, pointed linear leaves and spikes of sessile yellowish flowers. Because the falling leaves covering the ground act as a strong disinfectant, it makes for a healthy environment, and it also purifies water. It was assigned its botanical name in 1788 during Captain Cook's voyage and was historically used in French hospital obstetric wards because of its antiseptic properties. It is still a popular ingredient for toothpaste and mouth sprays. Niaouli oil is extracted from the young leaves and twigs by steam distillation. The main chemical components of niaouli oil are 1,8-cineole, y-terpineol, limonene, a-phellandrene, a and b pinene, linalool and piperitone. 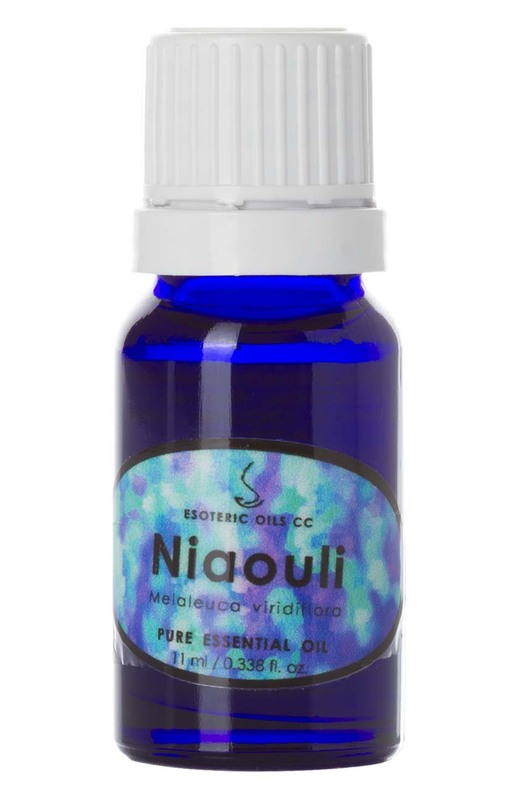 Niaouli oil helps to increases concentration and clears the head, while lifting the spirits. Since it has wonderfully antiseptic properties, it is most useful to fight infections such as colds, fevers, flu, chest infections, bronchitis, tuberculosis, pneumonia, whooping cough, asthma, sinusitis, sore throats, catarrh and laryngitis. It furthermore is useful against enteritis, dysentery, intestinal parasites, cystitis and urinary infection and to relieve the pain of rheumatism and neuralgia. As a disinfectant, niaouli oil is valuable for washing wounds to clear up ulcers, acne, blemishes, boils, burns, cuts, insect bites, as well as acting as a decongestant on oily skin. Niaouli oil's great benefit lies in its disinfecting properties, to fortify the body against infections, to tone the digestive system and to assist in any infection on the skin. Although most essential oils blend well with one another, Niaouli oil blends particularly well with coriander, fennel, juniper, lavender, lime, pine and peppermint.